MG - Peugeot | What Car? 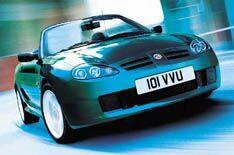 Despite its cars being, on average, the youngest in our survey, MG was a disappointing 21st overall. The ('02-'05) TF proved the strongest, with 25 claims per 100 cars, while its predecessor, the F, was worst at 37 claims per 100. At least the average labour rate was among the lowest around, at 90 an hour. Another good result from Mini, finishing eighth overall. A third of cars that failed suffered electrical issues, although engine problems were rare. The average Mini labour rate was more than 82 an hour, the highest in the survey, while the maximum rate was 162 an hour. Possibly the biggest surprise of the survey was Mitsubishi's fourth place, with all but one of its cars gaining a full five-star reliability rating. The most dependable was the ('95-'99) Carisma, which beat the later ('99-'05) Carisma. The ('97-'03) Galant was by far the least reliable, with 37 claims per 100 cars and a two-star reliability rating. Nissan is consistently in the top 10 most-reliable manufacturers, and this year the popular X-Trail is its most-dependable model, with just four failures per 100 cars. The Micra, Almera and Primera weren't far behind. Axle, suspension and electric complaints caused the lion's share of repairs, but braking and fuel systems were also a slight weakness. Average repair bills were low though, at 277. No change for Peugeot in terms of position over last year's survey, but the frequency of warranty repairs has risen, with cars proving slightly less reliable. Peugeot's only model with top marks for reliability, the ('91-'96) 106, had 18 claims per 100 cars. The ('01-present) 307 could manage only a mid-table result at 37 claims per 100, but the villain was the ('00-present) 607, with 41 claims per 100 cars.